Prepare an ice bath. Bring a small pot of salted water to a boil. Add the asparagus and blanch for 20 seconds or so or until they turn bright green. Scoop the asparagus out and transfer to the ice bath, reserving the hot salted water. Place the noodles into the hot water and let stand for 15 minutes or until soft. Drain the noodles in a sieve or colander, reserving the water again. Bring the water back up to a boil, adding more if necessary to cook the shrimp. Add the shrimp and cook until pink and firm. Drain and cool in the cold water with the asparagus. 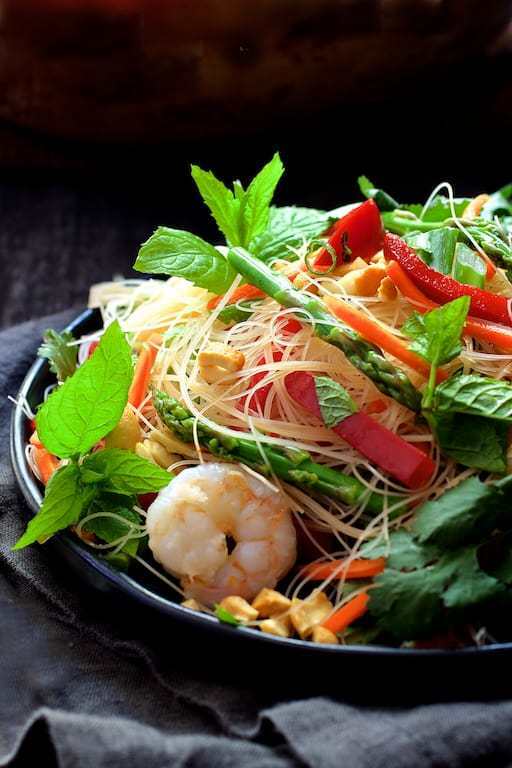 Combine noodles, asparagus, shrimp, red bell pepper, carrots and herbs in a large bowl. Add dressing and nuts. Whisk ingredients together in a small bowl. Adjust sweetness with sugar if needed. Toss with salad and serve immediately.